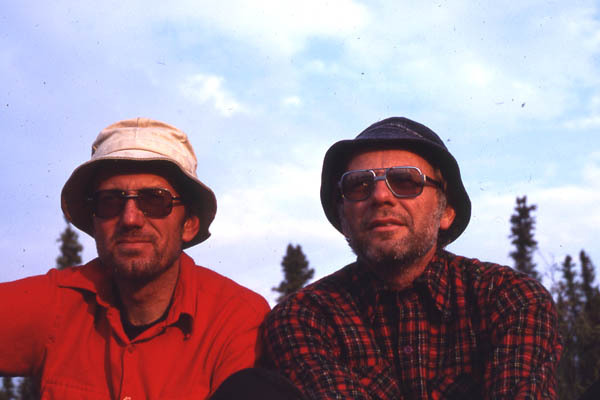 In the summer of 1980 my brother-in-law, the late Robert Gilpin, and I undertook a canoe trip in the Canadian barren lands. 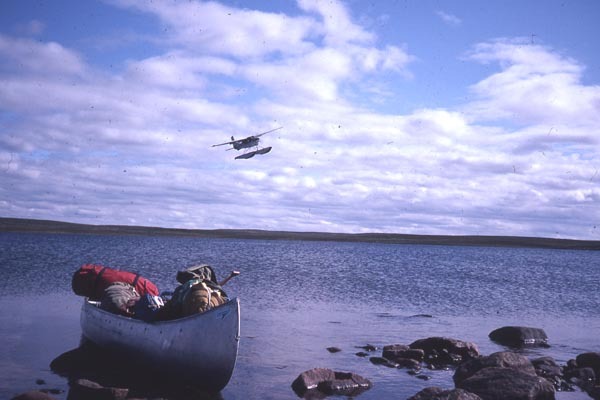 We were ferried by bush plane from Yellowknife in the Northwest Territories to Clinton-Colden Lake. 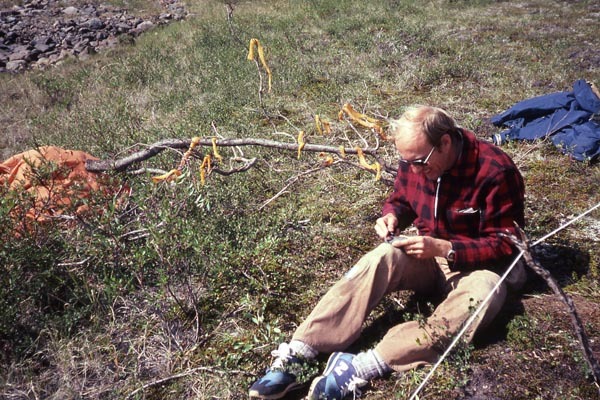 From this point, we canoed alone for 12 days along the series of lakes and streams which make up the Lockhart river system and took us back to the Great Slave Lake. 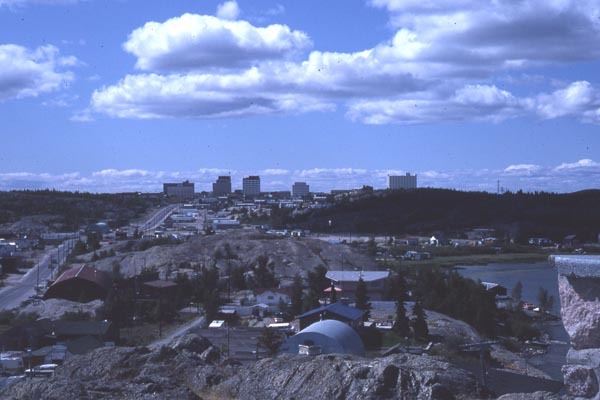 The region that we canoed is east of Yellowknife and the Great Slave Lake in the Canadian Northwest Territory. 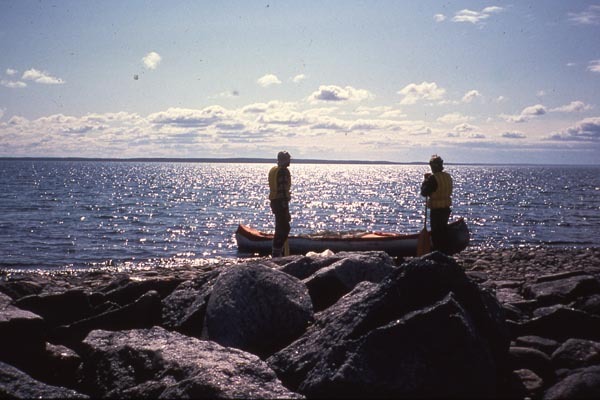 We canoed from the Clinton-Colden Lake region along Artillery Lake to the Great Slave Lake near Reliance. 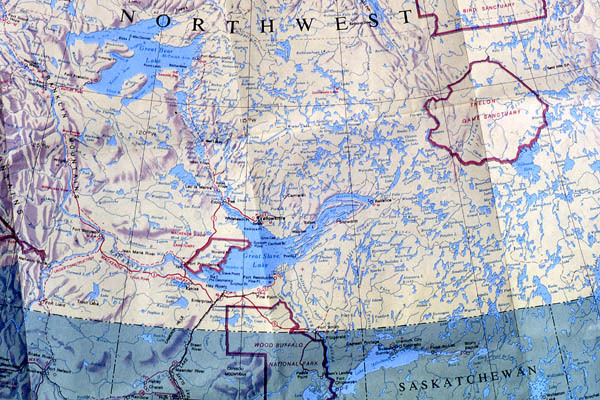 This region can be seen in the center of the map. 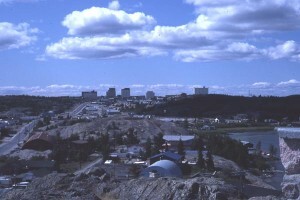 A 1980 view of Yellowknife from a near by hill. 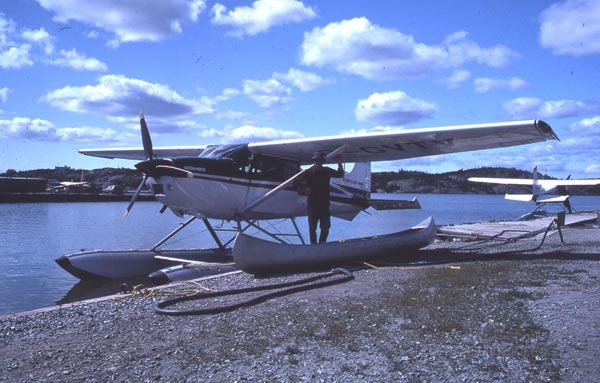 Strapping our Aluminum canoe to the left pontoon struts of the Cessna 185 which will fly us to our destination. 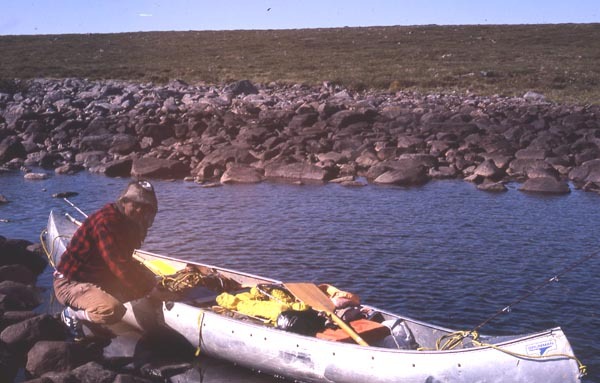 The canoe and the bulk of our supplies were shipped to Yellowknife by truck from Edmonton, Alberta where Bob lived. 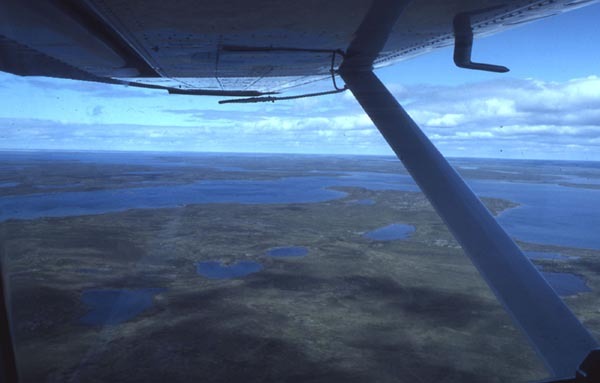 Nothing but flat terrain and a series of lakes and islands on the way to our drop off point. We eagerly search for our landing spot in a land where everything pretty much looks the same. The pilot puts the plane at the spot we wanted. The pilot and plane leave us on our own for the next 12 days. I prepare the first evening’s meal with my head net on. Yes, those fuzzy blurs are mosquitoes! There were two conditions which minimized the bugs. 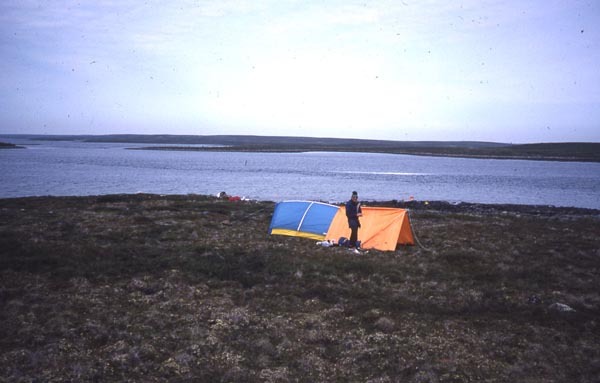 One was when the wind was really brisk and the other was when the temperature went below 40 deg F.
We start our next day filled with enthusiasm and anxious to get on the open water to get away from the mosquitoes. 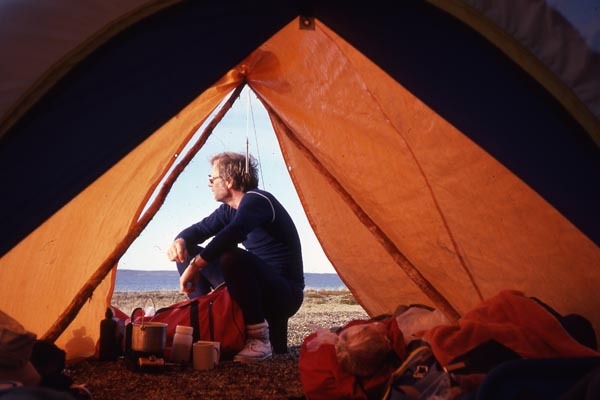 One of our typical camp sights. I enjoy a relaxing morning coffee. 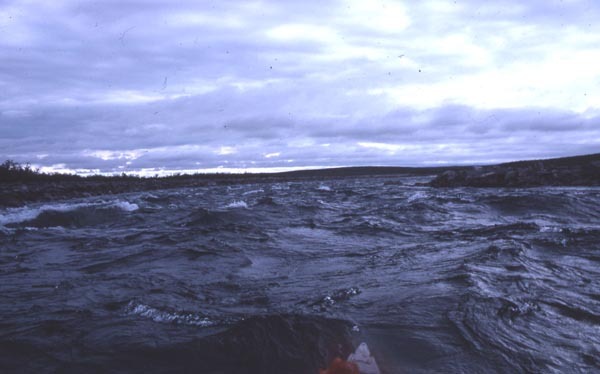 We manage some gentle rapids in one of the streams between lakes. A portage around some risky rapids. 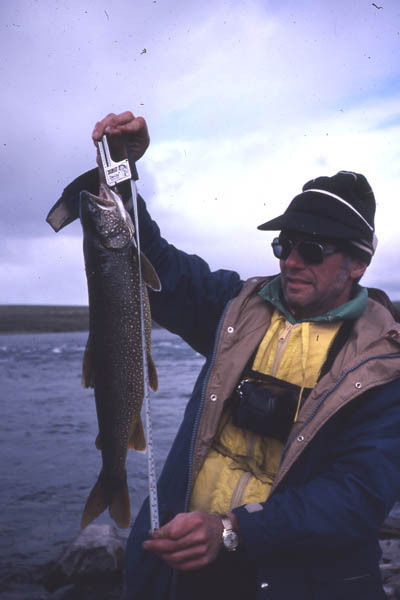 One of the many lake trout that we caught for our meals. 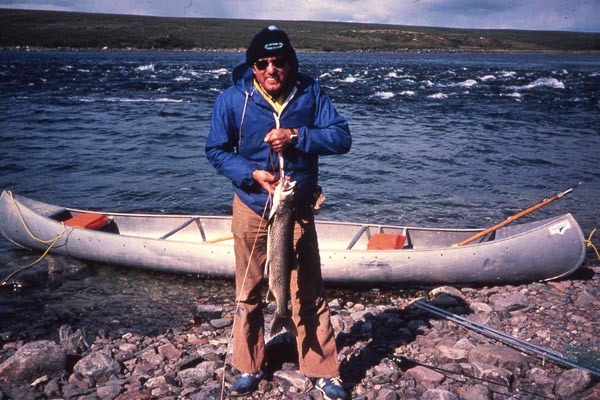 One of the big lake trout that Bob did not let get away. The fishing was so good that we cut the barbs off our spinners to give the fish a better fighting chance. 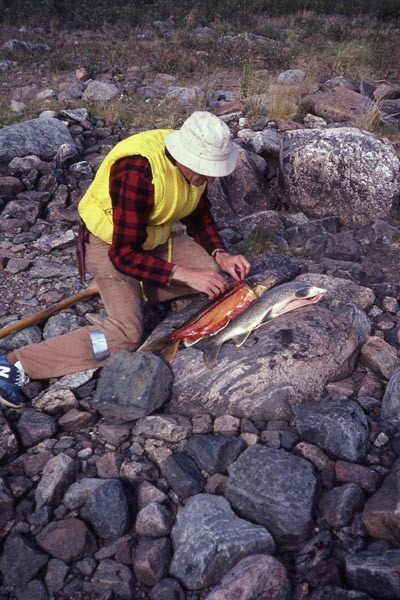 Bob prepares some lake trout for roasting. 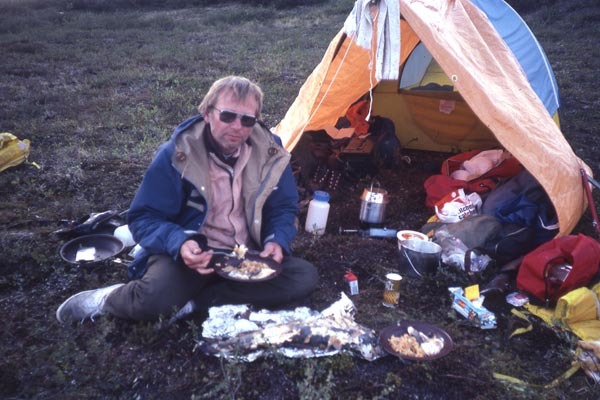 I prepare some trout with onions and wild boletus mushrooms that I readily found. 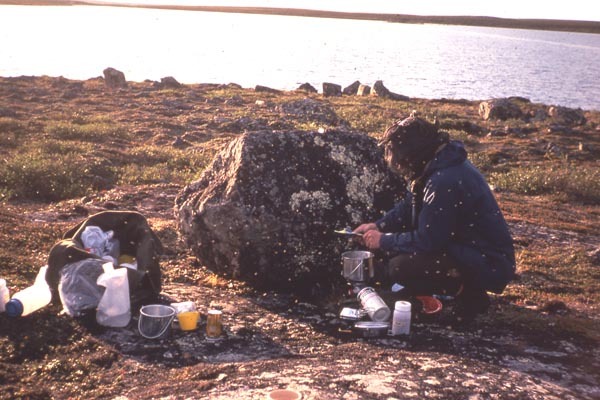 We caught so much fish that we had to find novel ways of preparing the fish that we kept. 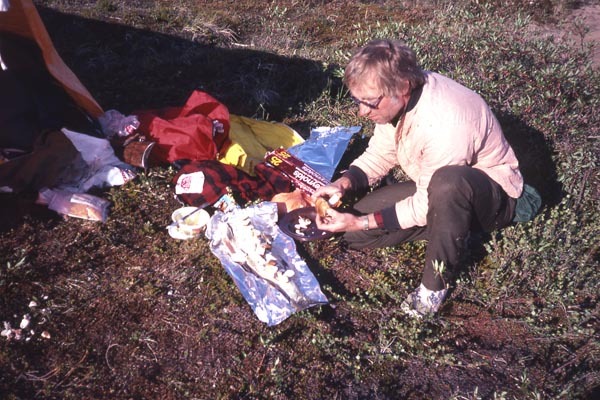 Bob makes strips of marinated trout which we dried in the wind to eat as fish jerky. 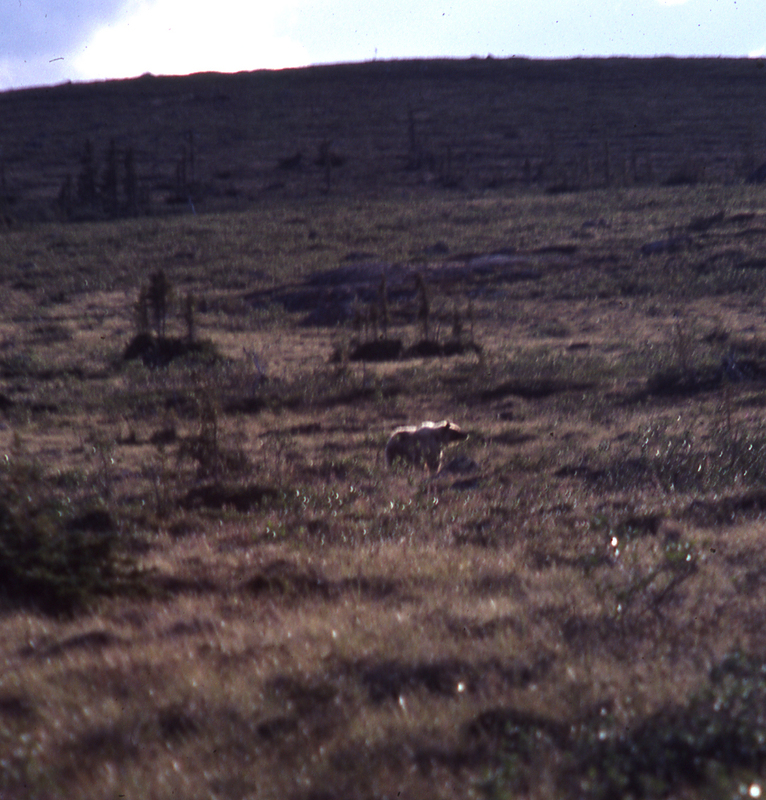 When this grizzly bear got scent of all our fish, we felt it was time to move on. 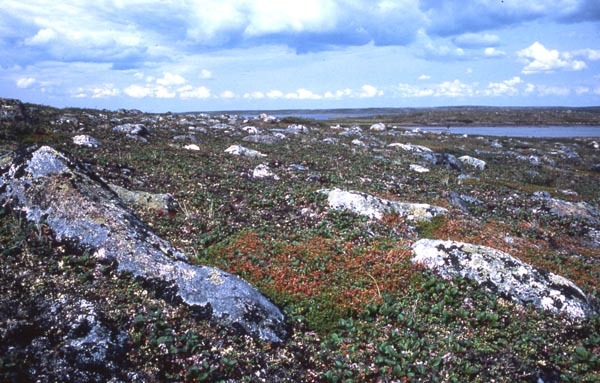 A view of the barren-land landscape. 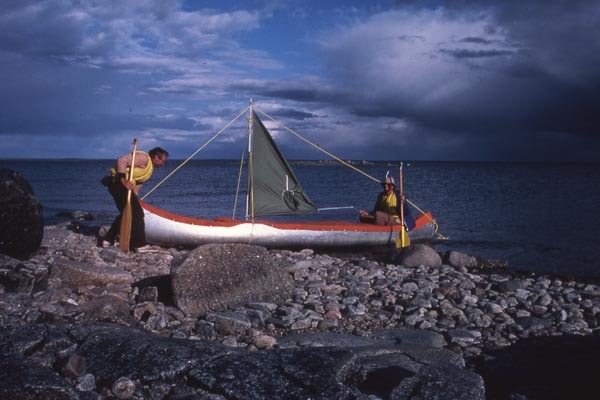 We improvise a sail from some of our camping gear for the voyage down Artillery Lake. 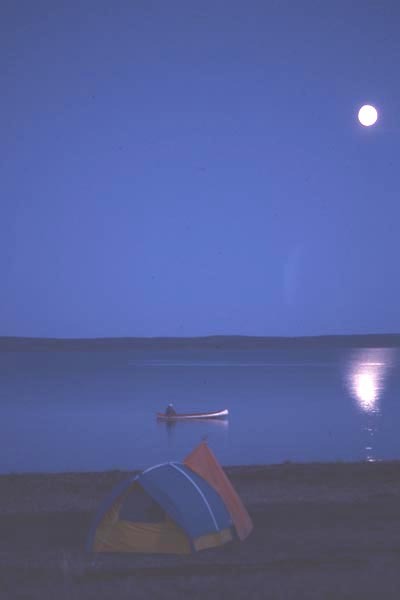 A moon lit evening on Artillery Lake. 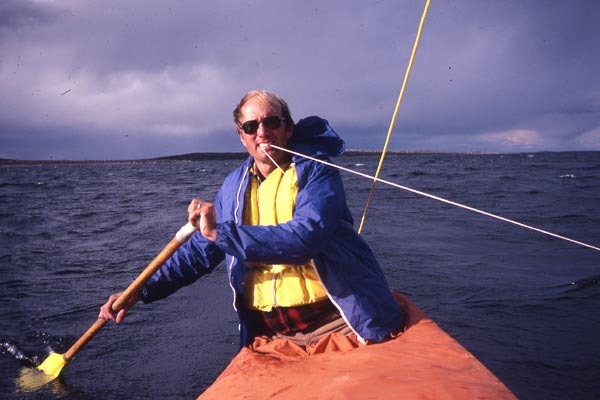 Bob at the tiller of our makeshift sailing craft. 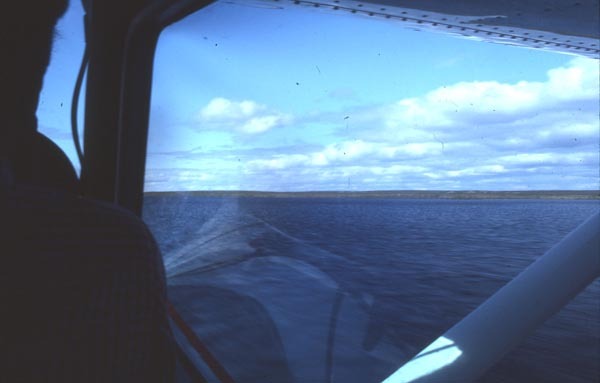 As we head toward the Great Slave lake, we start to cross the tree line. 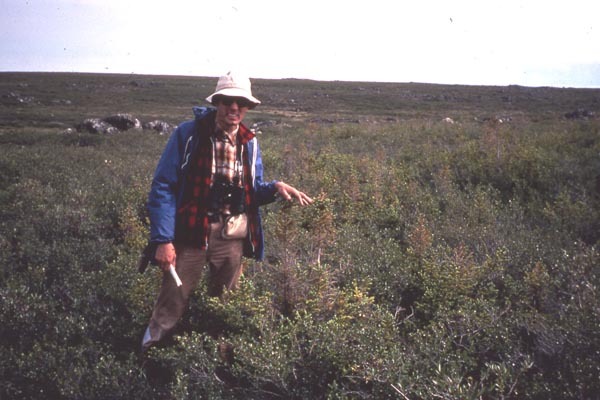 These dwarf trees will have much larger cousins as we continue our voyage. 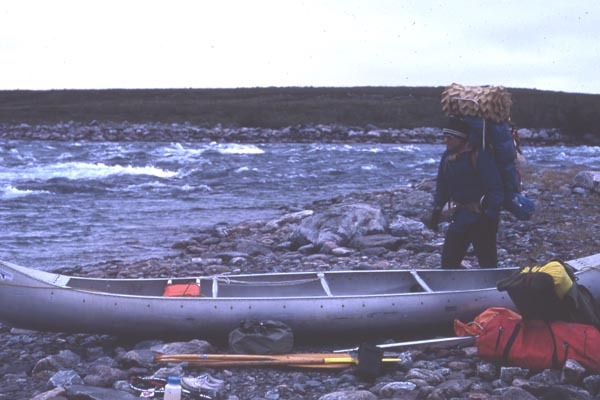 Unloading for a portage. 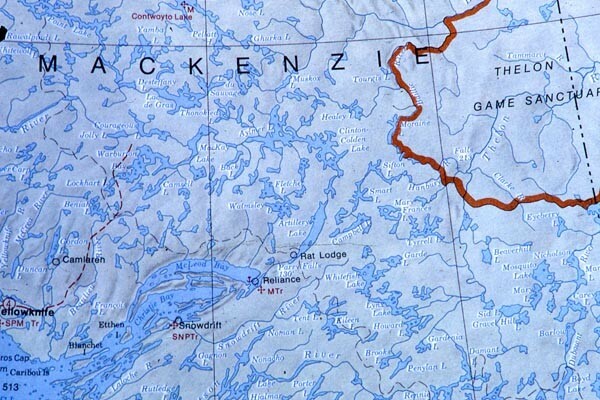 Instead of continuing on the Lockhart River to the Great Slave Lake, we followed Pike’s Portage This portage starts at the end of Artillery Lake and consists of a series of small lakes and streams south of the river. 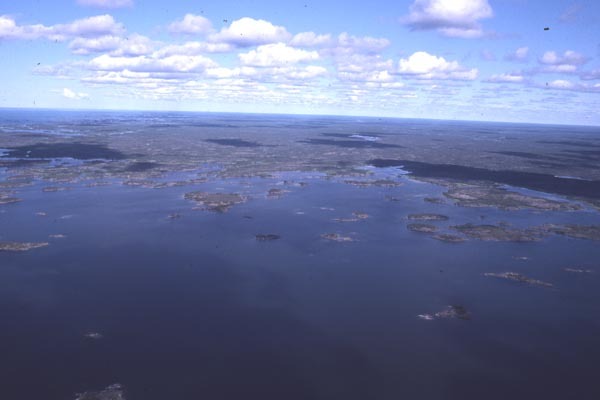 This provides a by pass of the stretch of the Lockhart River which is not navigable. We prepare for a dip and a well deserved wash-up on one of the more pleasant days. 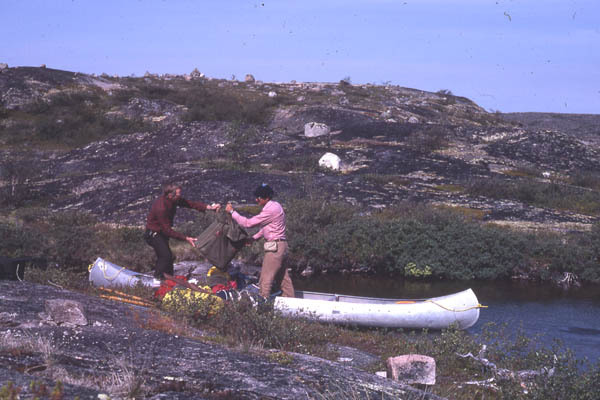 We set up camp early one day while on Pike’s Portage so that we could walk to the Lockhart River to see Parry Fall’s. We signed in at the cairn which some one had set up above the falls. 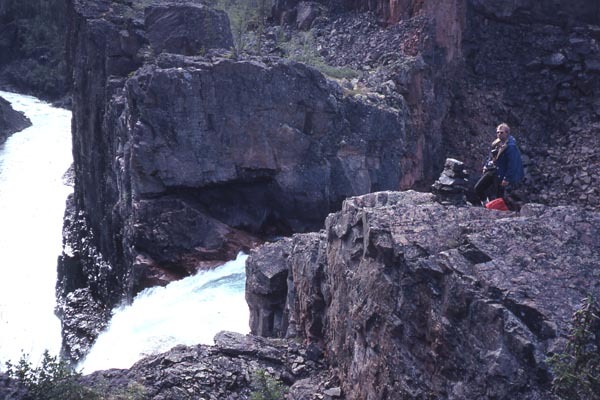 This part of the river consists of rapids and falls on its way to the Great Slave lake. 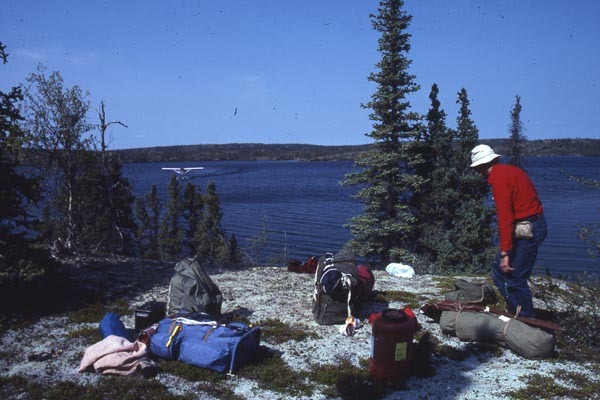 Bob gathers up some of our equipment while the bush pilot taxis to shore to pick us up for our return flight to Yellowknife. A portrait of us on the last evening.